After having played the 6S45P for a few days I decided to try to improve hum by rewiring the heater and signal wires and reworking the star ground system. I ran the heater wires along the wall, and stretched two coaxial wires directly to the sockets, across the inside of the amp, Taking care to cross other wires at close to 90 degrees. This reduced hum somewhat, but it was still present. The next step was to rebuild the power supply on a tag board. This would eliminate the ground plane on the PCB and create a cleaner single ground point to chassis. The Christmas holidays are coming and the darkest part of the winter is here, only 4 hours of light each day. 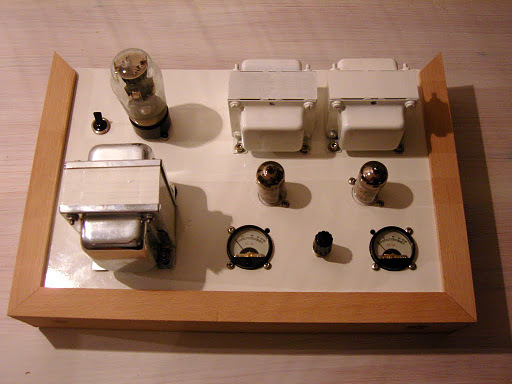 I have time, again, to work on my 6S45P amplifier continued from part two. 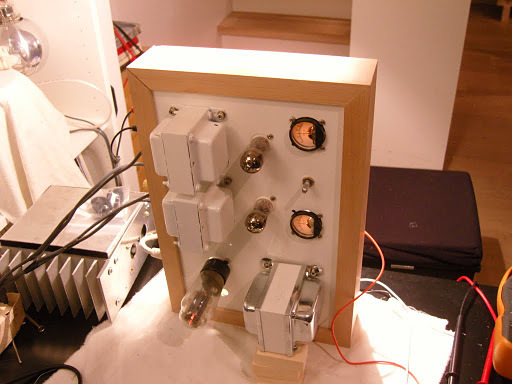 Assembling the 6S45P amplifier Part three – this one. 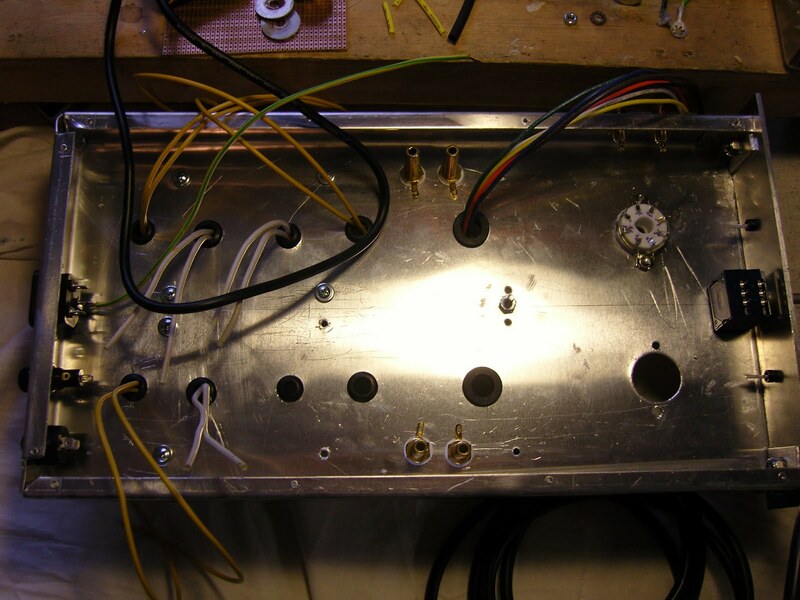 Today I began soldering the output transformer to the banana sockets in the back of the amp. The wire was bent and zip-tied in place to give a neat appearance. 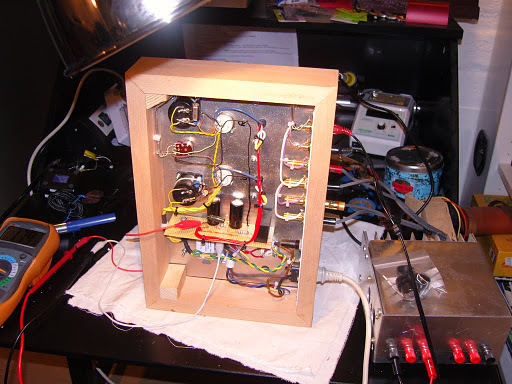 I am hoping to finish this amp really neatly inside since it is so simple. I also mounted the signal input wires from the RCA plugs. I used CAT 5 twisted pairs encapsulated in thick aluminum foil to avoid hum. 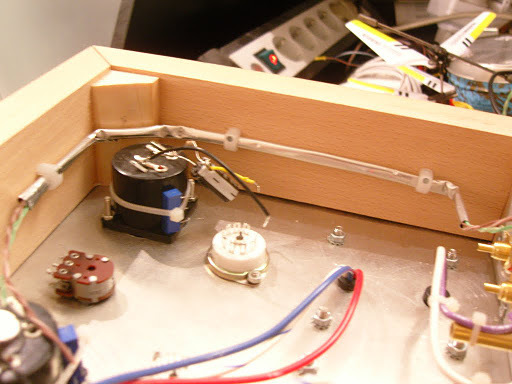 The wire package was tacked to the inside frame to be as far from the power supply as possible. Now I had to decide on an operating point. The datasheet recommends 30mA at 150V, but several builders have tested the tube to be robust far beyond that point. After experimenting on the breadboard earlier this year I decided on operating the 6S45P at 175V and 40mA which will put the operating point just below the recommended power dissipation limit shown as the purple curve. In the diagram below the red lines point at the operating point, and the green line shows the voltage swing with an input of 2 Volts, typical max from a modern CD player. 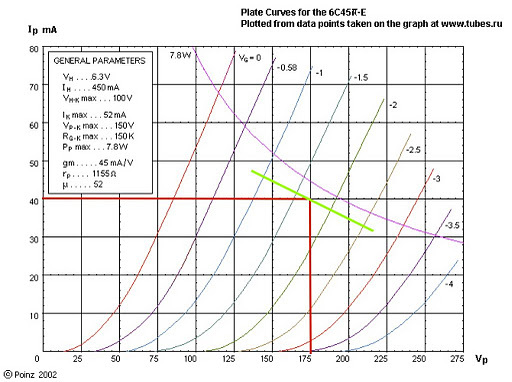 The slope of the green line is calculated by finding how much current is lost over 100Volts when loaded with the 5000ohm transformer. I=U/R so 100/50000=0.02A. So the slope is 20mA per 100Volts. 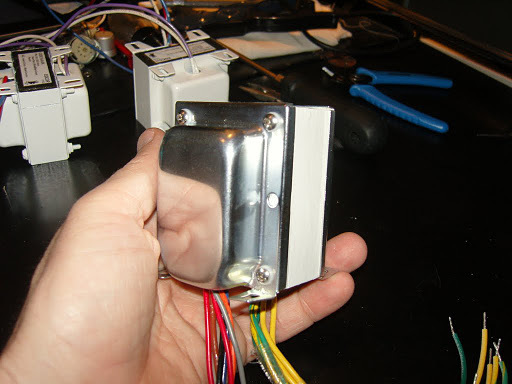 Next I built the power supply, which is the most components in the design. This amp is almost only a power supply and 5 other components. I simulated the power supply, roughly, in Duncan Amps PSUD2. Since I was using the Russian 5Ц4С I found nearest equivalent 5Z4P (unfortunately not G) data on Duncan amps pages and added to PSUD2´s rectifier list. 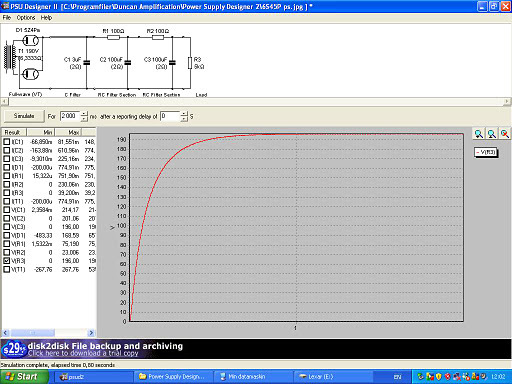 The transformer is 240 to 190-0-190v and I used rectifier load of 5K to simulate my 5K output transformer. Usually it is recommended to use current draw for the operating point, but it did not seem to match my breadboard results. A confounding factor was not having the precise manufacturers data on the transformer or 5U4S in PSUD2. Closest approximation in PSUD2 with Resistive load 5k. 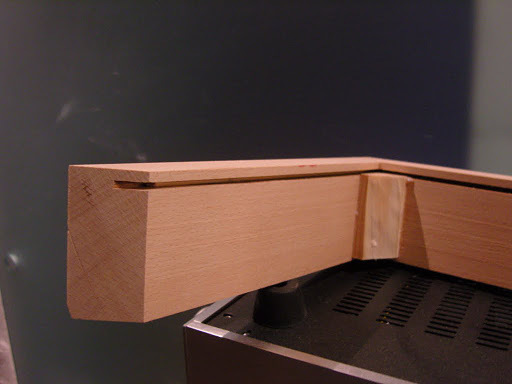 I built the power supply´s smoothing section on a piece of experimenters board bolted at 90 degrees to the chassis. I could have isolated the board creating a better star ground point, but was impatient to get going. The power transformer has several optional taps that I cut short, isolated with heat shrink, and zip tied. 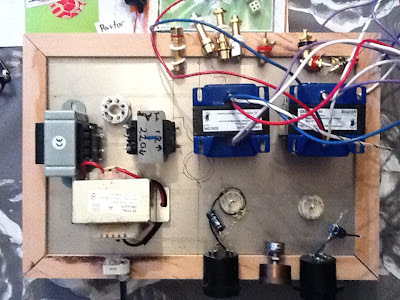 At this point the dream of clean wiring started to crumble – as it usually does! First capacitor 3uF to the left, then 100uF, 100R, 100uF, 100R, red wire i B+. Angle brackets keep the board in place. Green/Yellow wire is heater for the rectifier. Important: the bleeder resistor is connected between the two 100uF caps to drain them at power of. Overview of the power supply. The switch is not mounted to the brown wire yet. I prefer switching through a ground fault protection switch. 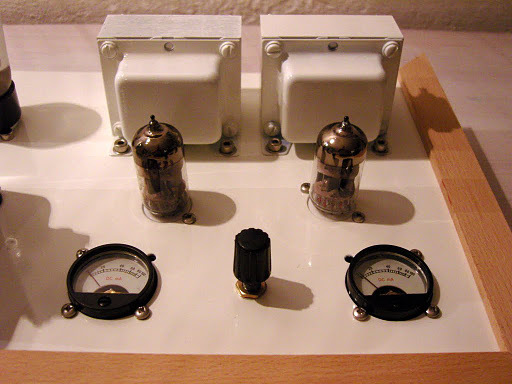 Next I wired up the amplifier tubes. The 6S45P has several connecting points for cathode and grid. you only need to use one, so I chose the ones that reduced crossed wires to a minimum. 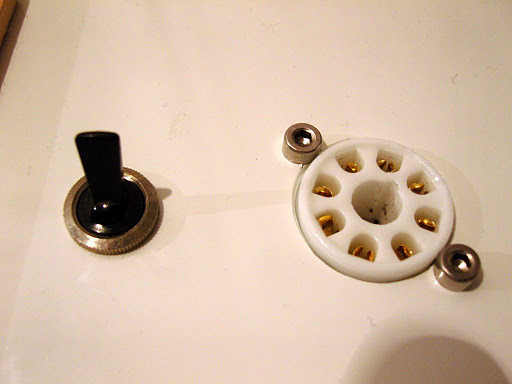 for novices pins are counted clockwise as seen from under the socket. starting from the gap on nine pin mini or from the key on octal sockets. Socket wiring: Yellow pin 4 and 5 is heater, Orange pin 6 is cathode, Blue pin 7 is plate, Green pin 8 is grid and black in the middle is a local start ground for this channel. 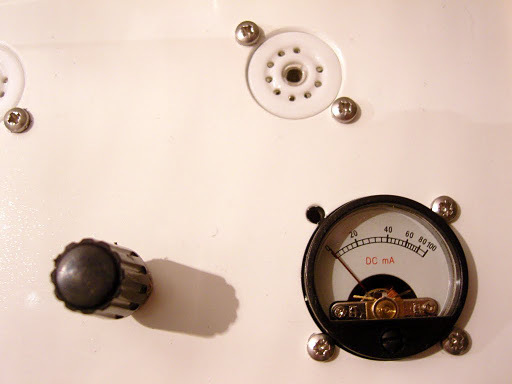 The mA meter is connected to ground and then the cathode bias is created by series connecting a 22ohm resistor to a 50ohm trim potentiometer. A 470uF 35V capacitor is connected in parallel to the resistors. the light in the mA meter is fed 6.3v ac in parallel to the heaters. Here is the first attempt at wiring. Not so neat after all. As usual. 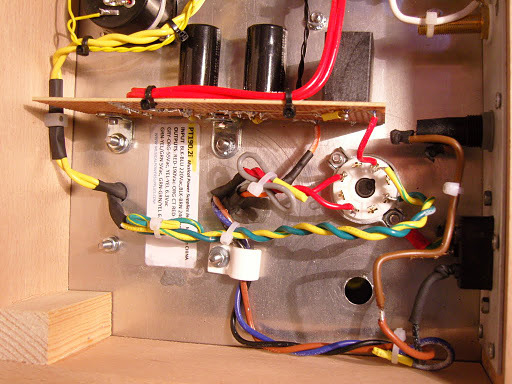 The yellow ac heater wires should not be routed out into the circuit, but kept along the side. First power up. Oh why do I never get round to finishing that variac and light bulb load? I connect three multimeters to B+, filament 6.3v and 5 volt, the onboard mA meters show me the current. 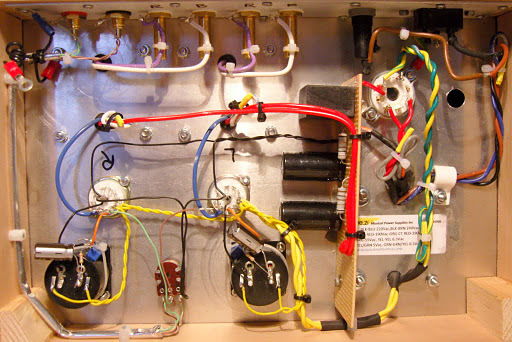 Connect the amp through a ground fault switch, and hope for the best …. NO Smoke! The rectifier takes about 10 seconds to conduct properly. All voltages pretty good. I need to reduce minimum cathode resistance to get to 40mA. I can´t adjust it with the 33ohm limiting resistor I have now. Test with sound. One channel has a bad contact. After powering down and waiting for capacitors to drain I locate it by poking at contacts with a screwdriver. Its a resistor in the cathode circuit. Now all I have to do is mount the switch and build the bottom. Three voltmeters and the dummy load connected for first power up. Also I have a automatic ground fault switch connected to the mains cord, and switch mains of remotely. The final schematic with measured voltages in red. A perfect beginners project! UPDATE: I am not completely happy with Musical Power supplies for this application due to to the magnetic field inducing hum in trafo cover. I did have some hum, and when reworking the layout hum in the transformer also was reduced. 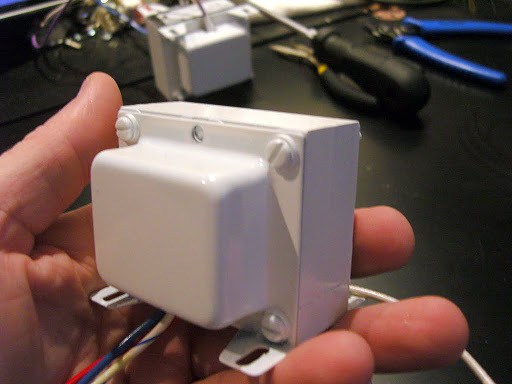 you might consider equivalent Edcor or even Sowther power transformers. 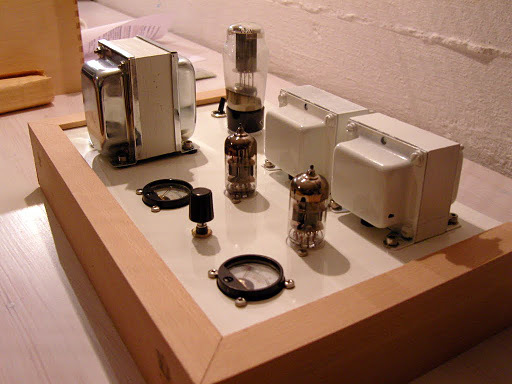 There a often discussions about what is the best beginners tube amplifier on forums like DIY Audio etc. 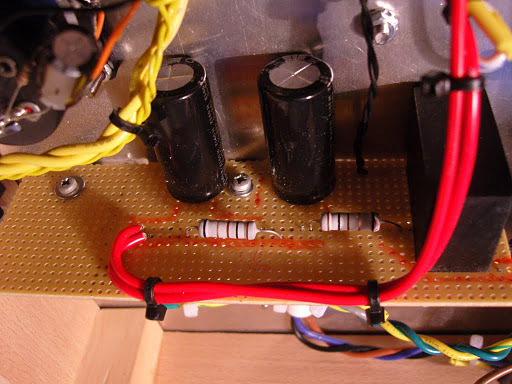 I think this amplifier is the best place you can start because voltages are relatively low. (still deadly tho). You can follow up the amplifier build with a nice 95dB/w full range speaker and spend some quality time wondering why people spend tens of thousands on high end equipment. 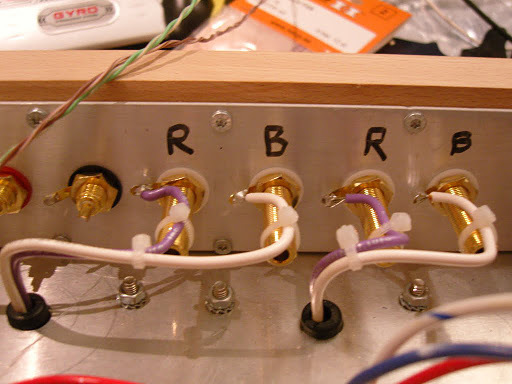 Finishing the 6S45P amplifier Part three – top of this one. The summer vacation is over and the weather is turning grey and rainy again here. Time to start making a finished version of the 6S45P breadboard prototype I built in April. My follow through ability has been too low, there are several projects floating in limbo right now. We´ll see what the winter brings. The plan with this amp is to do a couple of new things, at least for me. 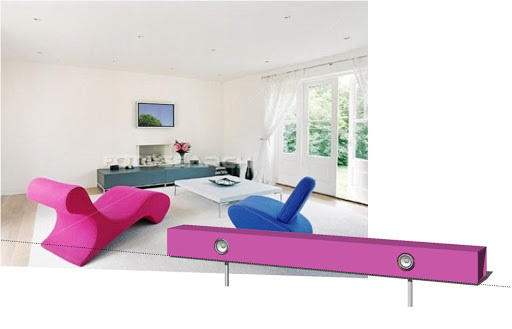 I want to build the chassis in the traditional style of using an aluminum sheet for mounting all the components, and then fixing the sheet in a wooden frame. The second thing I want to try is to use the 5Ц4С as a hybrid rectifier bridge. this uses an octal socket so if it does not work I have several other options. For output transformers I am still using the Edcor GXSE 10-6-5K transformers from the breadboard, but for the power supply I decided to buy a transformer with all the necessary supply’s rather than to patch together something with several simple power transformers I already have. I decided to take a chance on a no-brand transformer from China, sold through musicalpowersupplies.com on Ebay. Type nr. PT190.2i: primary voltage 220 or 240V, secondary 190-0-55-190 centertapped, 6.3V x 3A, 5V/6.3Vx2A filament winding. Edcor GXSE 10-6-5K, 6 ohm output. Painted all white. 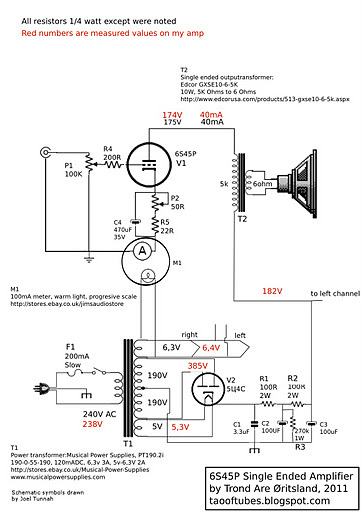 There are several considerations when planning an amplifier layout. First you should make sure the power transformer is far from the sensitive input signal. Then the magnetic field of the power transformer should be far from the output transformers, and preferably oriented 90 degrees to avoid inducing noise in the output. All the components should be arranged around a star ground, preferably with a sub star for the noisy power supply. And then there is the issue of routing the filament wires away from the signal wires and positioning things to make it easy to do point to point wiring. Finally the design should be visually pleasing and the controls should be placed in a position were they are easy to reach and see. Finally the design is starting to take shape! 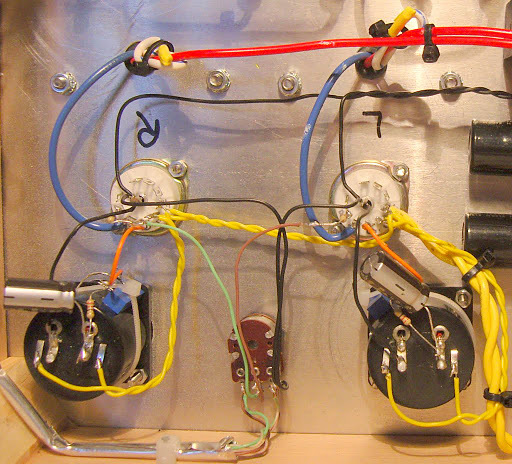 I will have the power transformer in the front left with a rectifier tube behind it. 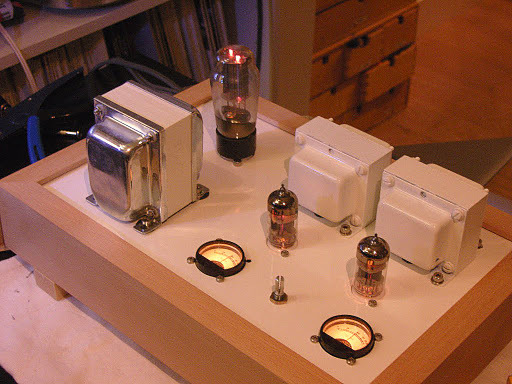 The output transformers are in the middle and right rear and create a symmetrical space in front for the tubes and the mA meters. In the middle front is the volume control. Power switch and fuse is on the rear panel left. Update11 october 2011: Another two months passed by before I managed to continue the project. In the meantime I have painted parts. The only part left now is the back panel so its time to mount all the hardware and see what I have created. Before I show all the pictures, Yes, I know I didn’t turn the power transformer 90 degrees like I said. It didn’t look good and took room from the rectifier. Since its pretty far away, I´m taking my chances. Here is the eye-candy! One of the screws for the amp meter is missing this is the hole for adjusting current. Volume knob is temporary, but black works pretty well, I think. 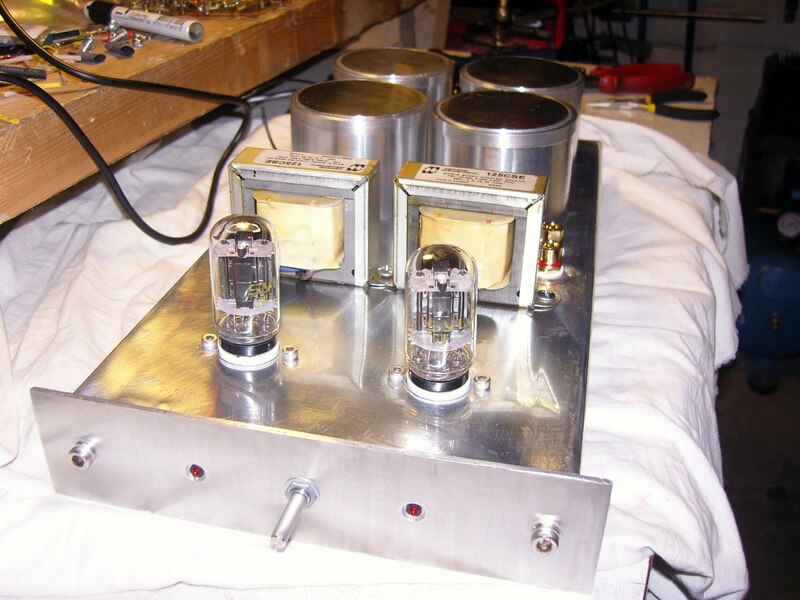 Within a month of completing the prototype circuit described below I was building an aluminum chassis for making a full dual mono single ended triode amplifier. I folded up the chassis from 2 mm aluminum, used 3 mm for the front and turned transformer pots from 4 mm x 80mm diameter tube. A mechanic at work helped out by CNC machining covers for the tubes. After drilling and cutting all the holes and polishing I have now mounted the hardware. Originally my plan was to have all the transformers potted, but two of the covers came out badly, so for now I am content just to leave the output transformers as they are and go on with the building. 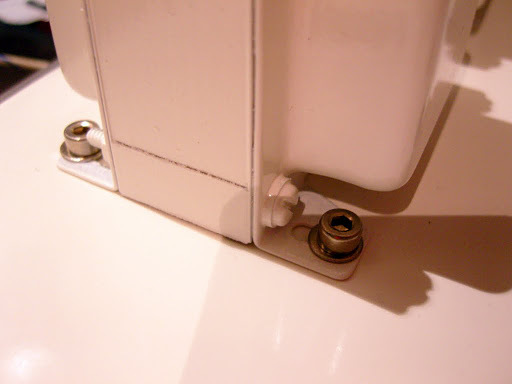 Power switch, fuse and AC socket are at the back. 235Vac to 12.6Vac transformers are at the back (left). Next come 12.6 to 210V plate voltage. 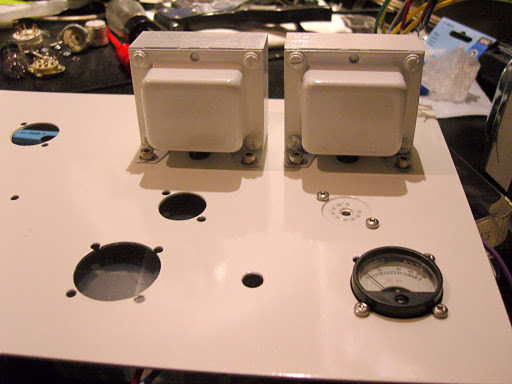 the high tension power supply is planned to go on a PCB under these transformers in the middle of the amp. Star ground will be on the bolt in the middle of the white reflection, between the output transformers. Then come the octal sockets. 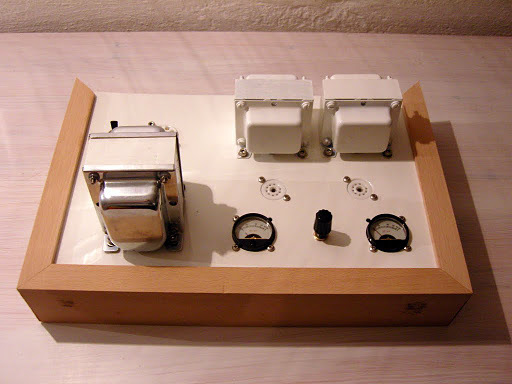 There is a ALPS 100K logarithmic potensiometer in the center of the front along with two red LED´s that will monitor the charge of the smoothing capacitors. I am buying my components from parts-express.com, also a bit from Partsconnexion. 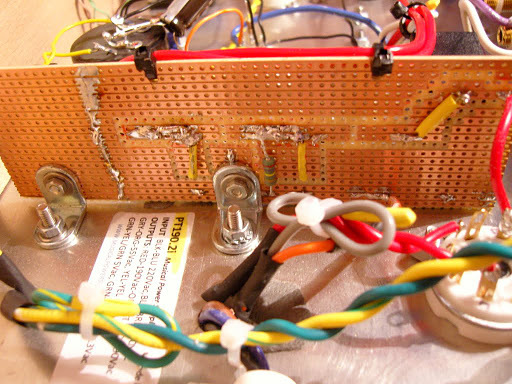 I use ruby gold capacitors for the power supply and 1N4007 diodes. From a local hardware store I got two cheap battery chargers rated at 2,4 amp 240v for the power supply, the first makes 13v for filament heating, the second is reversed and brings voltage back up to 230 or so. Since I am in a 240V county I don´t have to build the voltage doubler Nachbaur specifies, but in stead have to bring down the B+ voltage (for the plates), by tweaking the Capacitor, Resistor Capacitor (pi) filter. For understanding power supplies, I really recommend Duncan amps PSU DesignerII Its free and really cool software. I went for a dual mono design, figuring it was best to follow the plans precisely. That was before PSU Designer. (PSU=Power Supply Unit) In retrospect I would rather build it with a common power supply to reduce parts count. The PSU was soldered on stripboard, experimenters printed circuit board (PCB). 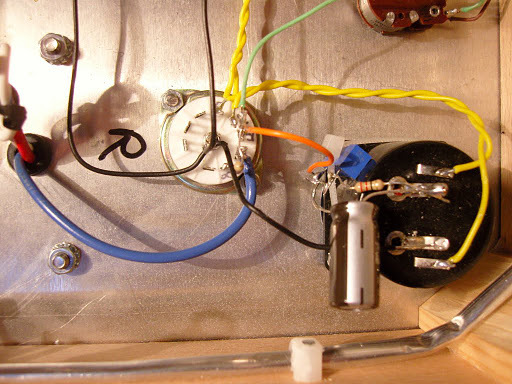 The rest of the amp, is built by point to point wiring around the sockets. Which are octal by the way, I dont think Nachbaur mentions this. I have a habit of raiding the local electronics shops dumpster and pulling out amplifiers and TVs. 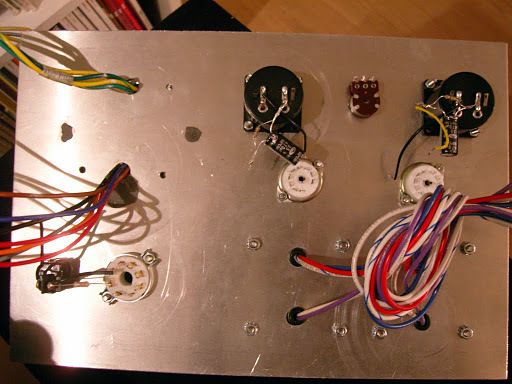 I used a couple of components from them as well as wiring from them. Mostly 18gauge 900v rated wire. A bit thicker for the filament. 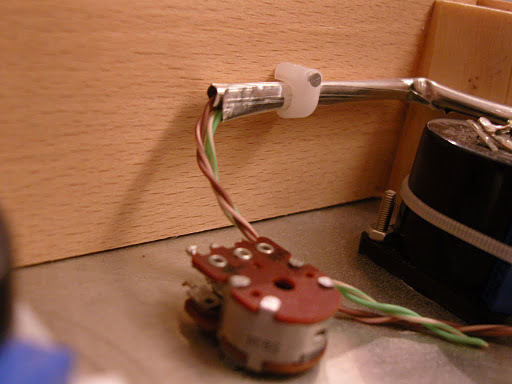 Remember to twist the filament wires tightly and keep them away from other the components. I kept the filament wires in the corners of the amp, and crossed other wires as close to 90 degress as possible to reduce hum, this is good practice. Another important thing is to orient your output transformers at 90 degrees. (Hammond 125CSE) Collect all the ground points at one spot for a star ground. This keeps ground potential even. For input signal I used Solen SM series foil caps and a logarithmic Alps potensiometer, and then more Solen caps for the coupling capacitors.